1st Bttrnt Sq. "What'll we be today?" --2nd Bttrnt Sq. "Gratin I think--scary!". This is delicious–I’ll stick my neck out. We had it with some seasoned quinoa (sautéed onion, garlic, a small chili and a little steamed broccoli) last night for dinner and nearly finished the lot. The recipe is adapted from one in the New York Times*, which in turn was adapted from a recipe in a cookbook by a legendary American food writer*, who most likely adapted it from something he ate in a restaurant in Provence*, which was probably invented by the grandmother of the restaurant owner*–who had passed it on to her daughter*. In other words it’s a version of a traditional seasonal gratin dish. It can be eaten as a vegetarian main course as we did last night or as an accompaniment to a roast chicken or some lamb chops–for instance. Combine all the ingredients in a large bowl and turn them over and over mixing them thoroughly together. Tip into a roasting tray or better still an earthenware ovenproof dish. Roast in the middle of the oven, for about an hour and a half–so it comes out nicely charred on top. 3*–All three names lost in the mist of time! 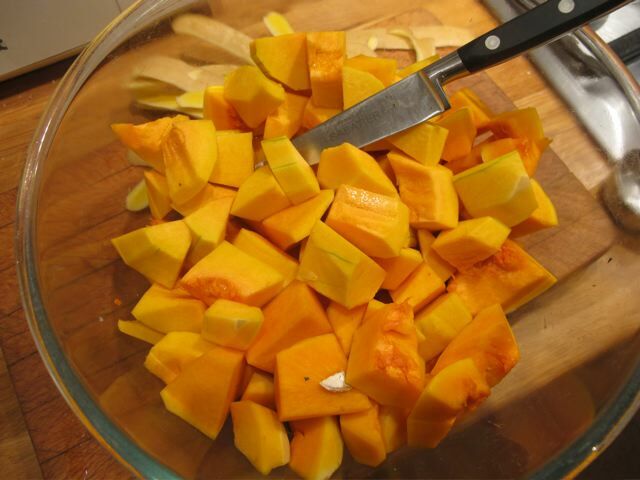 I have to confess that I have never tried butternut squash but looking at this it does make your mouth water.Robin you are certainly widening the scope of my cooking world I would not have given these a scond look, I will now. 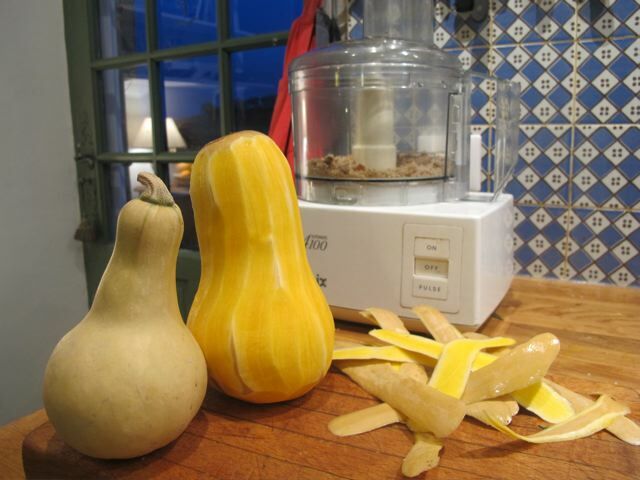 My neighbor had a bountiful harvest of butternut squash and this is a new, easy-looking recipe that I will try tonight. You have a real talent for food photography…all your photos look so yummy! Meredith takes a mean pic too and quite a lot of them! This looks delicious. 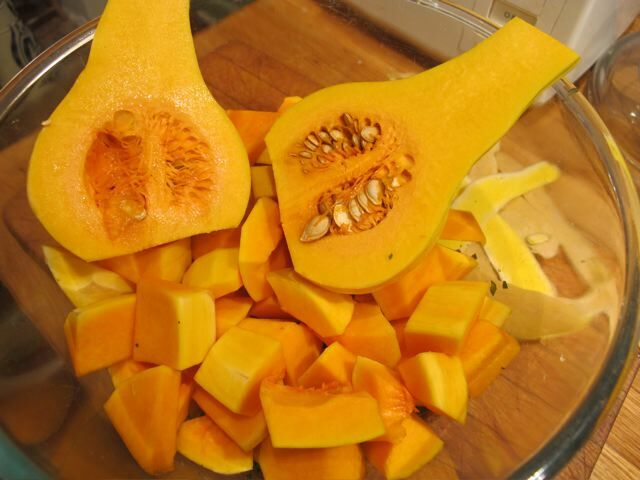 Presumably it would work with pumpkin as well – we had 2 huge ones donated by neighbours, one of which is now soup. 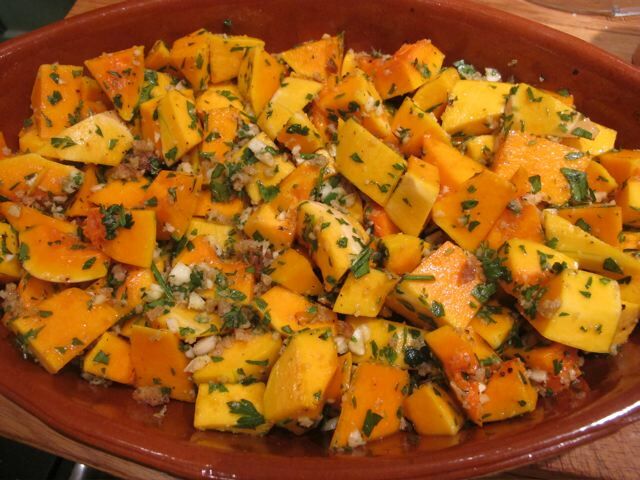 We roast winter vegetables in the way you describe with a combination of pumpkin, red onion (is that OK for you? 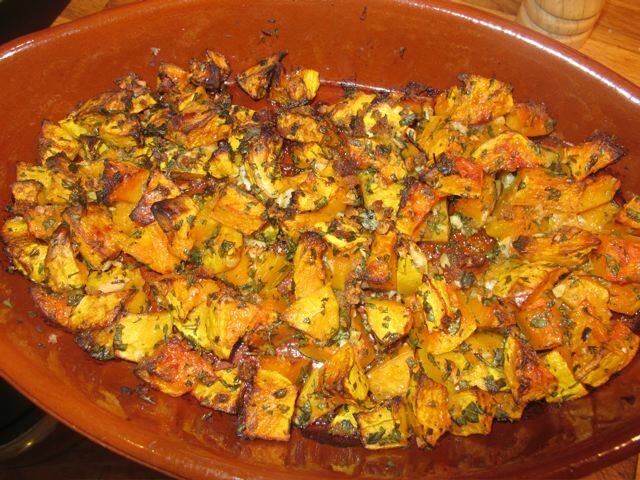 ), turnip, sweet potato – anything in fact that can be roasted without turning to mush. Excellent either on its own or with meat dishes and casseroles. Wow! This is so good. This recipe is a keeper.